When you are creating a profile either for your employee or customer, you often need special fields. This becomes quite a problem for business owners or managers to collect required information using default profile forms. If you are using an HR or CRM plugin for WordPress, you will eventually find the necessity of adding custom fields. For example, if you have different types of sales funnels, you may want to specify the funnel for your contact, leads or customers. Similarly, you may want to create a personality field for your employee's profiles. But the truth is most of the employee profiles in HR plugins, does not have such fields available by default and you may not add fields either. This a great hassle for managers to prepare the profile they need for their customers or employees. If you are a user of WP ERP, the best customer and employee management plugin for WordPress, you can solve this problem easily using the Custom Field Builder extension! Today, we are here to provide you an insight of our one of the best selling extensions of WP ERP. Basically, we will give a step by step guide on how you can use this extension for adding the fields you want to your user profiles. So, you want to add some extra fields to your ERP user profiles, right? All you need to do is to download, install and activate WP ERP Custom Field Builder! It's easy just like any other WP plugins. WordPress Dashboard (wp-admin) → ERP Settings → Customer Field Builder. From the UI, we can see that it is possible to create custom fields for three types of users – employee, contact, and company. Now, you need to add fields for your user profiles. You will have to click on the Add New Field button under the tab for which you want to create the field. 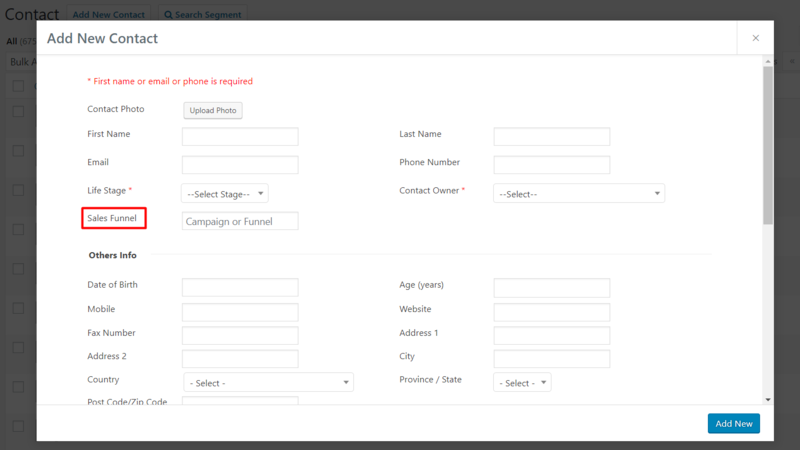 For example, we have chosen contact profile and added some fields. You can create fields with options like password, text, dropdown, radio button, checkbox, calendar date, email, URL, number field types etc. After you have created your field, click on the Save changes button. You can also customize your field according to your need. There are options for label, field type, placeholder, help-text etc. You can also specify whether the field is required or optional. Most importantly, you can choose where you want to place your custom fields. While customizing the field, you can select the section where the field will be added. Custom field builder extension also supports meta keys. You can add new fields with custom meta keys, which can be utilized in many cases. User experience is one of the fundamental parts of a solution. While you are creating a new profile or filling up a form, you might need to understand what the field is asking from you. This means you must know what you are supposed to enter in specific fields. For this, adding placeholders and help texts are good practices around the world. When you are adding a custom field to your contact, employee or company form, you can easily include placeholder text. This greatly helps your ma.nager or the person responsible for filling out the forms. This is how a contact profile look like after you have added custom fields. As you can see, it's really easy to add custom fields to your user profiles (CRM & HR only), now here's a short tutorial for you so that you can understand the process effectively. This will help you when you are planning to use this handy extension for your CRM or HR module.